This week, we climbed a mountain called Camelback, It was one of the hardest hikes I have ever done. It was really nice to spend some time with the zone and see a wonderful view of all the valley. This week the Mesa Arizona Easter Pageant started up and wow, is it amazing. It is a portrayal of Jesus Christ's life here in an actual play and does so very well. If I can go again, I'll bring the camera and maybe get some good pictures. We've been focusing on less actives and contacting all of our referrals lately and wow is it tough to catch people certain people at certain times of the day. That or, themselves being deaf, knocking on their door doesn't do a whole lot as you can probably imagine. This week though, we taught a part member family in an interesting situation. There are 2 grandparents, both deaf, their daughter, who is an interpreter, and her 2 children, one 11, and the other 7 (almost 8) and the children really want to be baptized. Their entire family is less active except for the grandmother whose semi-LA so when we go there to teach the only investigator is really the 11-year-old girl. But we really spend that time teaching the entire family. The Spirit has touched their hearts many times, I can tell. Our goal is to reach the mother, and the grandfather and hopefully help him become worthy to baptize his granddaughters. Wouldn't that be something? My companion, Elder Burr, was called to be a district leader for the next week because our previous DL went home, so we're thinking that It'll just be Elder Walker and myself next transfer as Elder Burr will probably be transferred English Speaking. I love you all and want to wish you a wonderful week! It's times like these where missionaries normally say a greeting in their language so show that they are learning the language and have not just left home doing who-knows-what. Unfortunately, ASL does not provide such a luxury so you will simply have to rely on my word and my spiritual experiences/thoughts to know that I have not just left home doing who-knows-what. The language is coming along great. I remember in the MTC about 2 weeks before I left, my teacher, Br. Featherstone, told me that my signing is very good and quite beautiful to see (can't say that much about other languages ;) but my receptive skills (understanding what others are signing to me) was dreadful (or awful, terrible, not-good-at-all...such can the sign that he used be translated). I remember my first week at church, I understood about 10% (optimistically). That is the time you truly learn how to smile and nod. One sister signed to me that first week and I caught signs where it looked like she said "last week...tree...shocked...sawing wood...sad...house...you do before?" By this time, I’m thinking she said, "last week, a tree got struck by lightning so they had to cut it down outside their house and it was a lot of work. Have you done that before?" so naturally, I respond "no". Now that I know a lot more and can remember (mostly) what she signed, she actually said, "3 weeks ago a tree fell down on my parent's house that scared them half to death (you would use 'shocked' as the sign for that). They were really sad because now they have to move to a different house while it gets rebuilt. Have you ever moved before?" COMPLETELY different story. Thankfully the Lord has been blessing my learning skills and I am now able to translate in Sacrament meeting, Priesthood, and take a larger part in our discussions. FYI: our mission has been approved for Facebook when the iPads come in, but our companionship has been given approval to start now. So I’ll be using my Facebook quite a bit now. We got our first new investigator for this month this last week. His name is Gordon Flash (I thought he was pulling our leg with that one) but he's a great guy who was very interesting in the gospel. Surprisingly, he's actually a Jehovah's Witness. The majority of the JWs seem hostile towards Mormons, that’s unfortunate, but he was very open, set a return appointment after we taught him the first discussion and I felt he was really touched by the spirit that was there. That just adds to the many evidences of the power of the spirit and the truthfulness of the gospel. I am so honored to have been chosen to serve a mission and to assist His children in any way that He sees fit. Have a great week everyone! We went to the Mesa Temple last Tuesday, and wow, that temple is amazing. It is, by far, the most different temple I've been to. But that's probably because it was the 7th temple dedicated in the world so...it's a bit older. Our zone had a meeting last week and we discussed our zone goal and what it should be. After an hour of discussion, we decided that we should focus on teaching members how to be missionaries (or at least do their home teaching). That decision we reached how? We kept running into the problem of having massive ward and branch records, but church attendance not matching. The number of investigators is fairly low right now across the mission, but the less active numbers are high. Therefore, that is our focus. Our mission president is so supportive of the deaf work here. It's wonderful. He's given attention to our special needs, is very supportive of our leaders and is willing to change things and make them work. He really is wonderful. As for my MTC companion's mission president, I see now why my dad felt that he should write this in my last letter, "One more thought that just came to me and I’m not sure how this applies to you at the moment but I know if one feels impressed by the spirit to say or do something, you should always do it, so here it goes: some may find fault with the gospel, the church, its leaders, their actions and complain and even rebel against-this leaves them on unstable ground and often they are left unto themselves, to kick against the pricks, to persecute the saints, and to fight against God (D&C 121)-be steadfast in sustaining the gospel in every way!" His mission president just recently got rid of one of the ASL areas in his mission. So now for the whole of Seattle and beyond, his area was more than doubled, without any increase to mileage, there's less than half of the ASL missionaries now (the rest were sent to do English work), their pool of investigators/less-active doubled, and they have no way to teach all of those people. 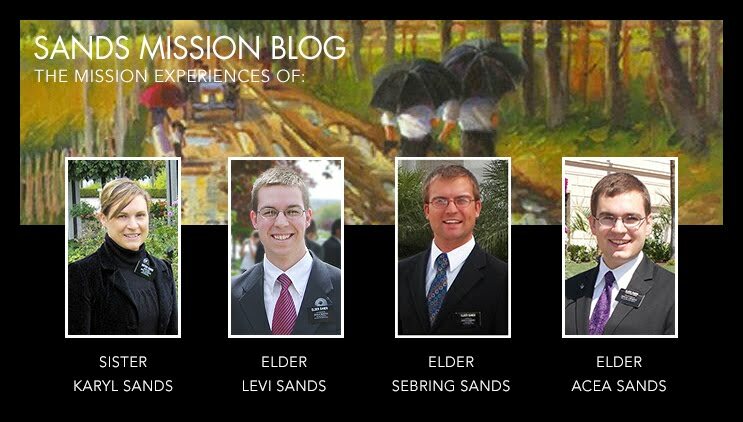 I know that the mission president is called of God, and that he really does receive revelation for the missionaries. I am so grateful that President Sweeney is so supportive and meeting with our branch president and branch mission leader monthly to discuss how he can better help the missionaries and the branch grow according to their vision as well as his. I really am going to miss him. I guess that brings me to the next point I have not told any of you about. A few years ago there was only one deaf branch for the Phoenix/Scottsdale/Mesa area until it got big enough for Mesa to be its own branch (some of the members were traveling for an hour and a half one way, just to go to church every week). Our building was centered to accommodate the center of the Phoenix/Scottsdale/Mesa area, it will soon be moved to be the center of the phoenix/Scottsdale area. Such a location will be outside of our mission boundaries and since we are tied to the branch, we will, in the next coming months, be moved to the Phoenix mission. So, I will be in a different mission, with different missionaries, and a different mission president, but it will be the exact same area. It will be quite interesting. On Sunday, we had a couple high councilors speak (yes, 2 at one time) and one of them spoke about the temple in such a beautiful way. It really made them, and the spirit they possess really come to life. He reminded me of my dad in many ways. First, he was just a couple years older than my dad when he converted to the gospel. He was married soon after and his story really mirrors what my dad went through. I really saw that in him when he spoke and could feel the power of his testimony as he bore it to his family who he had invited to that Sunday service. I know this church is true and that the Lord has put us down here to learn powerful, valuable lessons that will be for our benefit and good. This week we had a wonderful experience. This last Saturday was the Deafnation Expo. It’s an Expo where it’s only for those who are deaf, hard of hearing, CODA (Child of Deaf Adults), SODA (Spouse of Deaf Adult, or Sibling of Deaf Adult), or know sign language. Our branch set up a booth for the event and for 9 hours, we walked around and talked with everyone. We met several members, less active members, and a lot of nonmembers. We’ll see how fruitful it was when we start contacting all of our referrals we got. We set up a TV that repeated the last chapter in “The Testaments” over and over, Made a couple posters, had a couple banners and had a counter top full of the missionary pamphlets, ASL and English Books of Mormon, and “My Family” pamphlets. Overall, I think it effected many people who came to stop by. My receptive skills are improving rapidly, I can now understand a good 60% of what everyone in the deaf branch says. It used to be 20-ish. President Carpenter, the branch president who is the VP for Sorinson in Arizona (you can look it up), asked me to speak in Sacrament, 5 minutes before it started. They also needed someone to play the organ (don’t ask me why they need one when everyone’s deaf) so I got to do both. I actually really enjoyed it. I gave my talk, another two people spoke after me, and then the branch president spoke, and then we ended sacrament meeting 20 minutes early because he didn’t have anything more to say (that’s how effective sign language can be sometimes). I am enjoying the missionary work in ASL, immensely. I’m really glad I get to spend 2 years in this sacred work. So I’m at the library and I have about 1 minute to write you and I haven’t even read your letters yet. So I love you all and hopefully I’ll get more than 15 minutes next week. I will write on Monday. So if you saw my last letter, that was a perfect example of me panicking because I had just about a minute to write (frankly I’m quite impressed I got that much down). The moment I pressed the send button, I was saying aloud, "Oh please send, send, send!" and as I’m seeing Google sending it, I see my time have about 2 seconds left. The INSTANT Google finally said, "Your message has been sent" my clock hit 0 and shut down, wow, that timing was incredibly close. But anyways, on to the important stuff. I can't believe I’m going to say this, but... I think... I...like Arizona. Anyways, this place is actually quite cool (kind of cool, but mostly awesome). I do dread the arrival of summer though. I still hear it from many that it is a time to not be happy. We will see. So my area is all of Scottsdale, Phoenix, Glendale, some of Mesa, and several other areas around phoenix that I don't know the names of yet. So my area is really large, and most of my time (99%) is spent in Phoenix. I'll send pictures of my apartment, it's actually quite nice. My companions when I first arrived were Elders Brose and Burr, but now it is Elders, Burr and Walker. Transfers were just yesterday, which is why I’m writing you on Wednesday, so don't worry, I’ll write you on Monday too (*cheers from crowd*). The trippiest thing about this place is all the cactus. Wow this place has a ton of cactus. But the Temples here are BEAUTIFUL. Mesa with it's grounds make the temple really something to look at. The Fauna of Arizona is actually quite nice. The Phoenix Arizona Temple, which was dedicated in October, is the newest temple in the world and wow, is it the godliest thing I have ever seen. It is, by far, the best temple in the world (and has the coolest name, I mean, how cool is "Phoenix"? that is just an awesome sounding, and looking word). The way that the Friendship Park Branch works is very similar to how the deaf branch works. We meet in an old building, easily 60-70 years old and the branch has a combined youth program with the hearing ward right before it. I don't really know how that works, but it does somehow. There were about 20-30 people there on Sunday, and apparently, that was a decent number. I met several people there, and made a few friends. Some things about the deaf culture are that 1. They are too the point, and 2. Until they get to know you they might not completely trust you. They don't often take to strangers. Probably the scariest thing that has happened so far is driving with Elder Brose. Wow, it's scary. So deaf people, for the most part, can't speak. If someone is signing, then they need to look. And if they're talking, they let go of the steering wheel. So if Elder Brose wants to talk, he lets go of the steering wheel and makes micro adjustments about every second, but even then, that's kind of concerning. When people respond back-that’s when it is really kind of...terrifying. They look away from the road while they're "listening" to someone. Granted, they're all really good drivers, and they never look away from the road longer than a second or two, but still...not fun. Thanks for the sheet music. Actually, a few fun facts that I didn’t even know. I now have the record for the most special musical numbers played by a missionary in the history of the MTC. I preformed 9 times for the MTC in a variety of devotionals and firesides and for a few general authorities. I auditioned 27 times and played in sacrament meeting 4 times as well as being the branch pianist. Because of all of that, someone must have told my Mission President because the moment I landed, he had some music for me to play for our musical fireside and gave me 5 days to learn it. I thought I would be able to keep this a secret. I did so much at the MTC that now I have more mail from the MTC than I do from everybody else. They just keet sending me so many letters for the different things I did. It was kind of crazy. The thank you letter from the Branch Presidency was very nice though :) I'm gonna miss them. Ok, now I’ve really got to go, thanks for everything everyone and I will send pictures when I can!